Not just a burger. 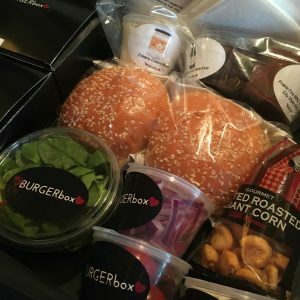 Each box is packed full of tasty goodies. 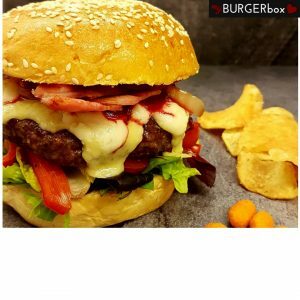 Have a look at the previous myburgers. Delicious. 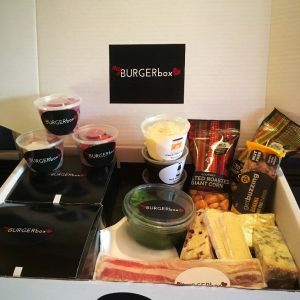 We want you to be excited every month when you receive myBURGERbox. Our passion is good food & our aim is to promote some of the finest farmers / butchers / cheese makers / manufacturers / producers in Britain. Including many who are so talented but still relatively unknown. 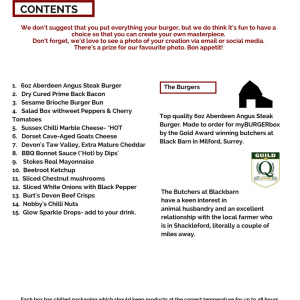 Superior quality British burgers, including rare and heritage breeds. Quarter pounders (4oz) to Half pounders (8oz), depending on the type of meat. Guaranteed to taste seriously good. 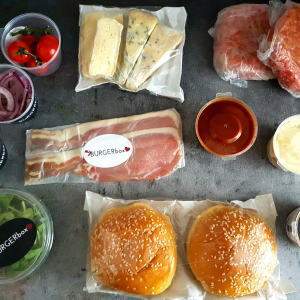 Beef, Lamb, Pork, Chicken & for our adventurous customers, we’ll offer lesser known British meats such as Goat & Ostrich. 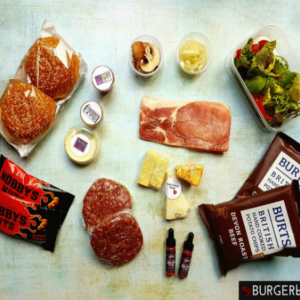 Each month myBURGERbox will include 2 varieties of British cheese. We LOVE cheese. We will deliver a selection of artisan condiments. We have discovered many mind-blowing flavours which we can’t wait to share. Lovingly-crafted Ketchup, Mustard, Mayonnaise, Hot & Spicy Sauces, Relish. Rubs, Garlic Mayo & BBQ. We LOVE the variety of tasty sauces. Bacon, Gammon, Mushrooms, Jalapenos, Avocado etc. Bacon will nearly always be included because British farmers are really good at producing Bacon & WE LOVE it. 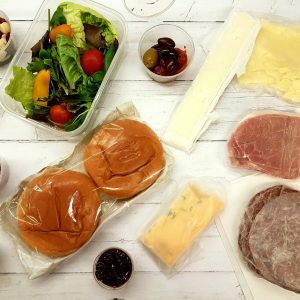 Including a few from: various salad leaves, Pea shoots, Rocket, Watercress, Tomatoes, Pickles, Red Onions, Shallots or Coleslaw. Random items from British artisans which we discover & want to share. 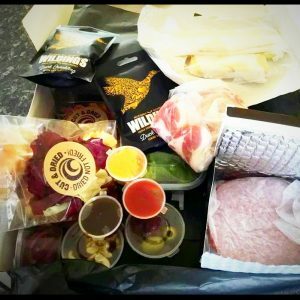 eg Jerky, Crisps, Duck Crackling, Dried Vegetable Crisps, White Chocolate & Cranberry Cookies, Popcorn, Snack Bars, Protein Bars, Drinks. 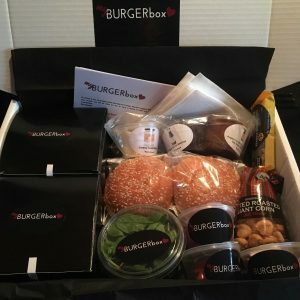 Every month your box will include one good quality bun to hug your burger.